A Splendid Messy Life: Weekends are for Reading - New Fall Book Club on A Splendid Messy Life! Weekends are for Reading - New Fall Book Club on A Splendid Messy Life! I have always had a love affair with reading. Remember those flimsy Scholastic book flyers from elementary school? When I saw the pile of those on the teacher's desk ready to be handed out, that was always my most favourite day. I would go home and circle all of the books I wanted to buy and negotiate with my parents which ones I was actually allowed to order. Lawrence Hill, Judy Blume, Nora Roberts, I love them all. I get butterflies just walking into Chapters. I'm so excited to announce something new on the blog this fall. A book club! I love talking about books with my friends and family, and now we can talk about them together as well :) Reading is so amazing because it really is an escape. Even if you're reading non-fiction, it's time just for you. Just you, your favourite mug with some tea, and a book. Those moments aren't always easy to steal and create, but when you get them, they're delicious. 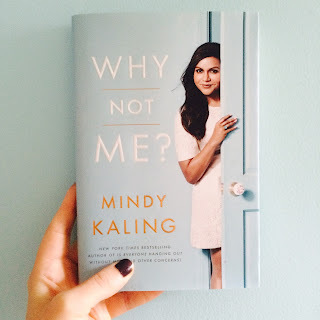 Earlier this week on Facebook, I took a poll of 4 different books to see what everyone would be interested in reading, and Mindy Kaling's new book Why Not Me? won by a landslide. It may not be the most conventional choice for a book club, but if that's what we're enthusiastic about, let's do it! I've already got my hands on a copy and can't wait to dive in. I loved her first book and am sure this one will be just as hilarious and honest. We will be discussing the book here on the blog on Friday, October 16th. You don't need to be online at a certain time of day. Just come on over and check out the Why Not Me? Discussion Post and join in. So, go grab a copy of Why Not Me? Buy it. Borrow it. Steal it from someone on the subway. (haha..don't really do that). I'm so excited about this, and I sincerely hope you join me reading something fun this fall.